EPA Administrator Scott Pruitt announced on Monday that, as expected, the Trump administration would seek to repeal the Clean Power Plan, the centerpiece of President Obama’s strategy to reduce carbon emissions at American power plants. The Obama plan, which was temporarily blocked from going into effect in an unusual Supreme Court ruling last year, sought to cut emissions from coal-fired power plants 32 percent by 2030, from a baseline of the levels recorded in 2005. 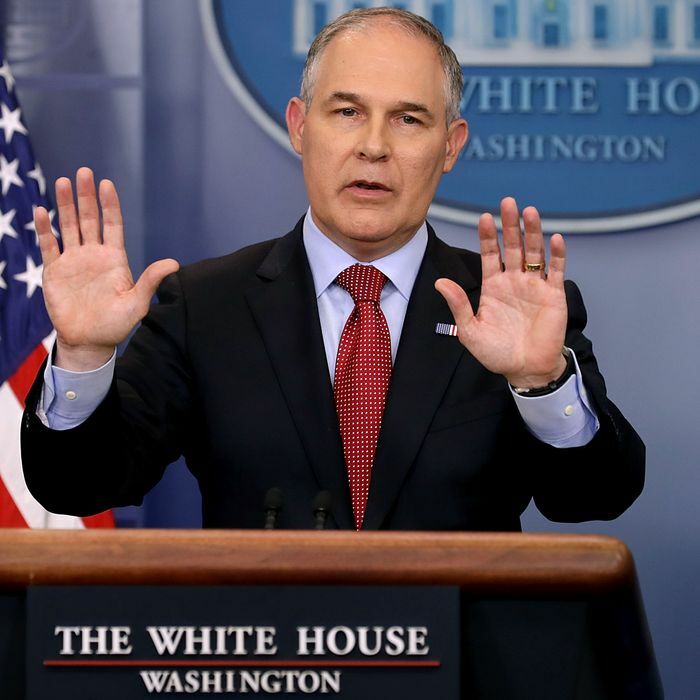 It was fiercely opposed by many lawmakers in conservative-leaning states, including Pruitt, who was Oklahoma’s attorney general at the time. In a lawsuit brought with industry groups, they contended that Obama had exceeded his regulatory authority by forcing power plants to not only slash their own emissions, but to build more energy-efficient installations elsewhere. The Supreme Court agreed with this interpretation, blocking the regulation pending more review by federal courts. The effects of repealing the plan altogether are unclear, in large part because some big states, like California and New York, are already moving full speed ahead to hit or exceed the target laid out by the initiative. And there are capitalistic forces at work, too. Despite the Trump administration’s preoccupation with coal miners — and in propping up their industry — there is no way to stop the irrevocable momentum of the energy market, which in recent years has favored clean energy, solar, and wind power over coal by a wide margin. Analyses have shown that the country may hit the Clean Power Plan emissions target even if the order does not go into effect. But, as the New York Times notes, nullifying the order would mean that many states, including Texas, Pennsylvania, and West Virginia, could get away with cutting emissions far less than they would have had to if the plan went into effect. This will make it more difficult to hit the goals the Obama administration put forth in the Paris Climate Agreement, which the Trump administration plans to withdraw from. Even if Pruitt isn’t ultimately successful in repealing the Clean Power Plan, the once-ardent foe of the EPA has already notched plenty of deregulatory accomplishments during his first months in the Trump administration, from reversing a ban on harmful pesticides to delaying regulations on toxic metals in public waterways — all with the help of the industry he’s supposed to police.